IntoNow which is an iOS based TV tagging app, has been acquired by Yahoo! For the uninitiated, IntoNow lets users check-in to TV content while they are watching the program on the TV. The app then lets users share it with their Facebook, twitter friends. According to TechCrunch, Yahoo grabbed the deal for the $20-$30 million. If that’s true then IntoNow made 2.5 million for each week they worked on the app, since the app has been live for only 12 weeks now. IntoNow will enable Yahoo! to provide enhanced media experiences and video programming, bolstering its social engagement across the Yahoo! network and on all screens. 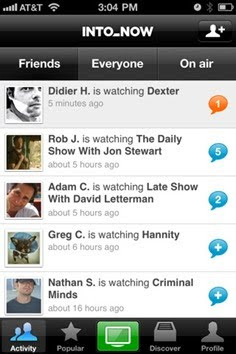 IntoNow users are able to easily engage with friends around the shows they enjoy most. IntoNow helps people discover new shows, discuss favorites with friends and learn more about them, and provides recommendations for what is currently airing based on their interests and those they are connected to. The application is also integrated with Facebook, Twitter, iTunes and Netflix to enable more sharing and information gathering. While Yahoo made this acquisition, Facebook and Google have somewhat similar product in their kitty with the ability to stream content online. It’s to be seen whether Yahoo implements similar feature in their new product. Although I wouldn’t be surprised if the app gets neglected in coming months, considering Yahoo’s reputation, all I hope is it doesn’t get killed or gets rumored to be sunset’d.